Wheelchair boot camp is here. 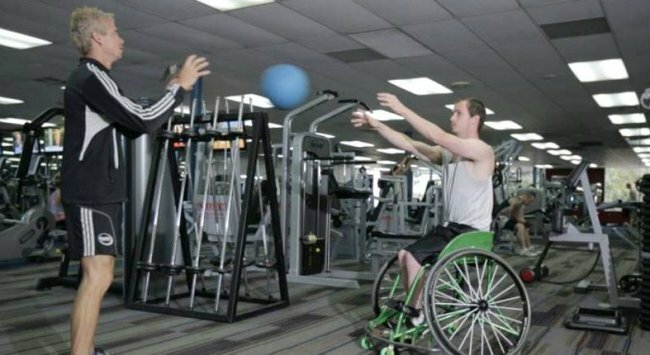 Wheelchair boot camp puts a twist on working out. Image: ABC. By Corey Hague. Boot camps have become a popular method for people looking to challenge themselves, get into shape and maybe extend their social circle. There is however at least one boot camp group in Sydney that puts a twist on working out. Wheelchair Boot Camp is a circuit specifically for people in wheelchairs. Benjamin Osborne is the man behind the idea and an ex-professional basketball player with a long history working with the Australian Gliders, the 2012 Paralympics silver medal-winning wheelchair basketball team. Mr Osborne approaches the sessions as a serious coach looking to get the most from his clients. After stepping away from his basketball coaching duties to spend more time with his young family, Mr Osborne is enjoying the process of creating specific fitness plans for the boot campers. Because every person who comes to the training has different fitness levels and different physical abilities, exercises are often adapted or changed to suit individuals. “I love thinking about how someone might be able to improve or do something different,” he said. While some trainers relish the chance to “break” their customers and push them through gruelling sessions, Mr Osborne has to consider their well being far beyond the boot camp. For an able-bodied person, sore shoulders or legs after intense training can be a nuisance; for someone in a wheelchair it could be devastating. “These people need their shoulders to live,” Mr Osborne said. Apart from the obvious complications of simply navigating through modern life in a wheelchair, wheelchair users are also at risk of becoming obese. This is because of the balance between food intake and energy expenditure, or energy in, energy out as it is known by dieticians. An able-bodied person will expend about 1,800 calories in an active day; for someone in a wheelchair, it may be half that number with the same food intake. Mr Osborne said rather than struggling to get his clients active, he has had to work hard slowing people down. “My challenge has been to hold people back a bit so that they build their fitness sustainably,” he said. A month into the current program he is yet to have a client take a day off, despite some people travelling from Liverpool and the central coast for sessions in the city. He believes the success is because of the attitude of the group and the chance to do something a bit different.